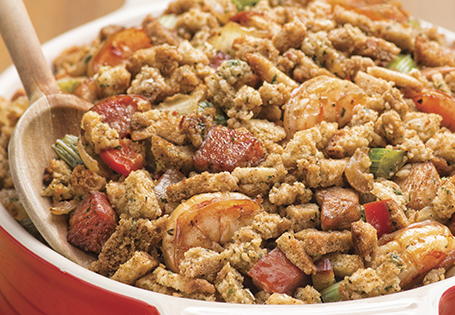 Spicy down-home flavors meet traditional stuffing to create a great side dish! In a medium sauté pan, melt 2 tablespoons butter over medium-high heat. Add chicken, cook until browned, about 7 minutes. Add shrimp and sausage, cook until browned, about 5 minutes. Add onion, celery, peppers and spices. Continue cooking until soft. Deglaze the pan with wine and cook for 1 minute or until wine has reduced. Add stock and bring to boil. Add stuffing mix and stir until well incorporated. Transfer to a greased baking dish. Top with 1 tablespoon of melted butter and bake for 15 minutes or until top is browned.